Xena and Diana have a chat in WARRIOR...PRINCESS. "We've all got that evil spot somewhere." For some of us, that evil spot is closer to the surface. Xena is one of those unfortunate enough to have to fight her evil spot everyday. Xenites have come to call Xena's evil spot, Dark Xena. When Xena's inner demons torture her to a breaking point that is when Dark Xena emerges. Luckily for the Xenaverse, Gabrielle is there to calm Xena's rage and recapture the demons, for a time, anyway. Nevertheless, every time Dark Xena surfaces, she brings about a change in Xena. This essay will focus on Xena's encounters with her "dark side", since she became good. Yes, Xena keeps saying that, but it is only a half-truth. She is not all-evil anymore, but she still kills -- that part of her is still with her. Though she has embraced goodness, she could still actually go either way. Gabrielle keeps her good. Xena gives herself up to the village mob in THE RECKONING. Xena's first repossession by the "Dark Xena" was in THE RECKONING (06/106) when Ares framed her for murder. Ares wanted Xena back on the wrong side of the tracks. He tempted her with an army of her choice. He spoke of her past glories while the friends of those murdered beat her while she was chained up in the jail. "Call forth that super-mortal strength of yours", Ares tempted. Xena then yelled at the top of her lungs and broke out of her chains. She also broke down the prison door with one solid kick and beat the guards. Gabrielle entered, and Xena, in a blind rage, hit Gabrielle with a mighty backhand, sending her flying. Gabrielle crashed against the stairs and then ran out. At that point, Xena regained control of herself. She tended to the wounded guards, and then went back to jail to await the judgment. While in jail, she walked around, thinking she would never see Gabrielle again. However, the young bard returned, wanting to break Xena out. Xena did not understand. What you did wasn't you. I know that. So, when Xena loses it, we, like the bard, are just supposed shrug it off and say it was not her? Nevertheless, it was her: that evil side is a part of inner being. Whether Dark Xena is in control, or buried deep, she is still a part of Xena. That is something Xena has to accept before she can move on. She has accepted that Dark Xena made her who she is today, but not that Dark Xena is still there, waiting to emerge. After the incident in THE RECKONING (06/106), Xena learned that Gabrielle would remain at her side through anything. It was a big comfort, but Xena also saw how easy it was for her to give in to Dark Xena, so she tried harder to prevent it. Ares impersonates Xena's father -- or is it really an impersonation -- in TIES THAT BIND. Xena's next encounter with Dark Xena was in TIES THAT BIND (20/120). This episode took place a good deal after THE RECKONING (06/106), meaning that Xena had become quite good at keeping Dark Xena away. In TIES THAT BIND (20/120), Ares disguised himself as Xena's father, who had walked out on Xena's family when she was little (at least, that is what Xena had been told). As her father, Atrius, Ares made Xena trust and love him. When they arrived in a small village they had set out to save, Atrius was captured, supposedly for betraying the villagers the last time he was there. Xena made a deal that if she saved the village from the oncoming army, the village would free her father. Xena defeated the army's commander and took over. She led the army to the village, only to find her father beaten and hung up for the vultures. Xena ordered the army to take the village. All the villagers were brought before Xena, and shortly after, Atrius died in her arms. Xena drew her sword and exclaimed, "Kill them all"! Xena grabbed the pitchfork and pulled Gabrielle behind her, out of the way. Gabrielle turned around and slammed the pitchfork against Xena, and it broke on her head. Gabrielle was shocked by her own actions, as Xena fell. When the Warrior Princess got back to her feet, the evil look had been replaced by one of utter shock. Xena had regained her control. A good smack was all she needed to pull her back. Xena was once more devastated by her actions. Being good was turning out to be a bigger challenge than she thought. This experience taught her about Gabrielle, as well. Gabrielle would not allow Xena to follow her old footprints. This time she only injured Xena, but, if necessary, could Gabrielle kill her? An interesting question for both Xena and the viewing audience. For Xena, it was even more reason to fight against Dark Xena. Xena is alone with her thoughts for a moment in THE PRICE. We have to give Xena credit! She lasted for a long time, but the past is difficult to overcome. Xena made it nearly to the end of season two, but in THE PRICE (44/220), Xena actually called on Dark Xena to help her! When Xena and Gabrielle came up against The Horde, a pack of men who hunted like wolves and killed like demons (e.g., skinning people while still alive), Xena knew that she would not be able to fight them alone. She even warned Gabrielle: "Things are going to get worse, especially with what I have to do to get us out of here". Tell us what to do, Xena. As this was the mantra for Dark Xena, Gabrielle was now getting a little nervous. Xena had already left a group of soldiers to die at the hands of The Horde along the riverbank, and now this. The way she said, "Kill them all", sent a shiver down Gabrielle's spine. However, Xena had not actually done anything too drastic...yet. But these men will die without water. Dark Xena had consumed Xena now, and Gabrielle was beginning to see it. The Athenians started a fight and led The Horde into the battlement, where all the attackers were killed. Xena wore a smile as she slit the throat of a Horde member. When one escaped, Gabrielle watched in horror, as Xena threw an ax into his back. Xena then joined Gabrielle in the storage room to confront her about all the food Gabrielle had distributed. things will kill us all. This is war! What did you expect? only the lesser degrees of evil. There is a choice -- to stop fighting. But have you even tried? Gabrielle could not believe what she was hearing. This was not her friend. Gabrielle saw that her Xena was not home, but Dark Xena was. Xena questions a prisoner in THE PRICE. not going to help us. Don't do this. It's murder. who dies? So I can be murderer too? I mean, chain him up. Your troops? I don't understand. fight to the death, they'll get it. I didn't think I'd need anymore. This episode marked the greatest development of Dark Xena and Xena. They were working as a unit. Dark Xena still held the control, but only because Xena had allowed it. In the last two lines of the dialogue above, we saw that Xena was speaking from both sides, as both Xena and Dark Xena. This was a scary time for Gabrielle (and fans), having never seen Xena like this before. Something had to be done. Gabrielle learned that the injured Horde members lying outside the walls were begging for water as they died. She left the safety of the battlement to give them water. The Horde surrounded her as Xena watched in horror. Fortunately, the Horde thought that Gabrielle was calling a short truce to retrieve the wounded. The Athenians also went out to get their soldiers while Xena went for Gabrielle. Mercer blows it big time and pays the ultimate price, no pun intended. At that point, the Athenian soldier, Mercer, who had been sent to get reinforcements crawled into the scene, unsuccessful and having had been mortally wounded. Gabrielle grimly told Xena, "Looks like you got your fight to the death". Through her compassion and her unwillingness to compromise her standards, Gabrielle reached Xena within the darkness. Xena opened her eyes and saw what she had become once more. She knew that she had to stop the war, and she had to do it her way, without Dark Xena. Xena learned that the Horde had a code of honor. She sent out her prisoner to fetch his leader. She then sent men to help Gabrielle in the hospital and sent food to the injured. It was then that Gabrielle knew her Xena was back. Later that evening, Xena joined Gabrielle in the hospital. She sat beside Gabrielle and told her that giving the water to the Horde was the right thing to do. know how much I love... that. Xena had had such trouble in this episode because she feared the Horde. Fear was an emotion that Xena did not often feel. This helped Dark Xena gain control of her. Again, Gabrielle helped Xena regain control. It was amazing that Xena had called on Dark Xena. Not only did it show us what people are capable of when terrorized, but also it added a new layer to Xena, and Gabrielle. Perhaps the single most terrifying Dark Xena moment ever displayed on Xena was visited in THE BITTER SUITE (58/312). In this episode, Xena had just lost her son, Solan, at the hands of Gabrielle's daughter, Hope. 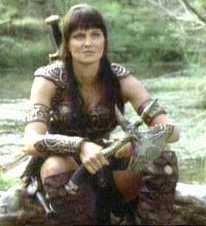 While Gabrielle was able to find friends and support with Joxer and the Amazons, Xena, by choice, was alone. Xena and Ares on a snowy mountaintop in THE BIITER SUITE. The Warrior Princess stood atop a high mountain with snow falling. The environment captured the nature of Xena's soul at that moment: dark, lonely, and cold. Ares moved in on her weakened state, sure that he could win her back. My son is dead, ya soulless b*st*rd! your will-- full of rage-- and revenge. what to do-- who to kill. Ares knew what to say to bring out the rage in the hurting warrior, and he was successful. Darkest Xena rode into the Amazon village, nothing but a force of rage and hatred. She came with only one thought in her mind: to torture and kill Gabrielle. Ephiny tried to stop the warrior, but Xena made short work of both Ephiny and the Amazon Nation, and later of Joxer. She roped Gabrielle's legs with her whip and then she hopped upon a nearby horse. She rode off, dragging Gabrielle across the lands of Greece. Dark Xena had full control as she dragged Gabrielle through fire, lakes and over rocks. She brought Gabrielle to a cliff and stared at her with hate-filled eyes. Xena was gone, and Dark Xena was making plans to stay. The one who had always helped Xena keep Dark Xena at bay was now the one Xena wanted to destroy, thus handing her soul to Dark Xena. Xena picked up Gabrielle over head, and in her final descent back into darkness, she screamed, "Vengeance", as she was about to throw Gabrielle off the cliff. However, the bard miraculously regained consciousness, and escaped from Xena's grasp. She looked at Xena, and yelled, "I hate you!" before taking them both over the cliff, and into Illusia. In Illusia, Xena was separated from Gabrielle, and seeing Callisto did not change her revenge-seeking attitude, "All right Callisto, cut the song and dance. What's going on? Where are we"? Callisto's song only added to Xena's annoyance, as the expression on her face became darker. Finally, Xena had had it with the riddles. ditties? Fine, I got one for ya. As far as I could throw ya." betrayed me, is she in this land? Callisto would not answer the question without a riddle, and still it was not an answer. Xena spun the wheel of fortune, wanting to find Gabrielle and finish what she started. Xena was brought into a hall filled with warriors ready to die at her word. Ares was there as well, taunting the warrior to do his bidding: to kill Gabrielle. Xena was not of a mind to fight her dark side, so when Gabrielle was placed before Xena, she did not give a second thought to driving her sword into the bard. Callisto came before her, and with her words, she reawakened Xena, who was then able to bury Dark Xena for the rest of the season. Xena in silk in DREAMWORKER. Xena actually got to face a personification of her evil side in DREAMWORKER (03/103) while in her dreamscape passage. Xena ran to open the door out of the passage, when someone laughed. Xena, dressed in a purple kimono, turned to see a figure standing in the shadows. Xena did not know who it was, but the figure spoke with Xena's voice and goaded her. haven't passed your final test. than any opponent you've ever faced. The figure stepped out of the shadows to reveal that she was Dark Xena, dressed in Xena's leather and breastplates, but with eyes of pure black. She reached a hand to Xena's face, but Xena turned her head. those years, don't you remember? felt right, it felt... good. that it can only mean one thing. Yes, it means what? Tell me. It means I finally get to kill you. the eyes of your victims. only one way out of this dreamscape. you are, I control you. Xena grabbed Dark Xena and threw her through the door, escaping from her dreamscape passage. She also escaped the temptation of Dark Xena for another day, but for how long? Although Xenites have come to enjoy watching Xena struggle with her inner demons, the struggle itself amazed me -- the fight of good and evil lived everyday in the soul of one woman. The Horde might have scared Xena, but the most terrifying thing for her (not counting losing those she cared for) was to once more give in to her "dark side", and to not be able to regain control. She feared becoming evil again. She also feared that she would never be able to get away from her evil temptation, something she expressed at the end of DREAMWORKER (03/103). Gabrielle was at a lake, and Xena walked up to her. mean, I was capable of it. you didn't cross that line. and what I saw scared me. go back to being calm. Yet as Gabrielle walked on, Xena looked back at the now calm lake and smiled. Perhaps Gabrielle was right. Maybe she could defeat Dark Xena and become calm. Maybe one day, she could be free. Known as Xena Torres: Warrior Writer online, I am an old timer Xenite, who loved Xena the SECOND she started kicking b*tt on the screen! BATTLE ON XENA! Love writing for Whoosh! and Warrior Princess Press, but writing fan fiction is STILL my fav to do! My work is posted on Tom's Xena Page. Favorite line: "I have many skills". THE BLACK WOLF (11/111), TIES THAT BIND (20/120), and HERE SHE COMES...MISS AMPHIPOLIS (35/211).